As the regional transportation planning agency (RTPA) for Santa Cruz County, the Regional Transportation Commission (RTC) is responsible for developing, implementing and regularly updating the Regional Transportation Plan (RTP) for Santa Cruz County. The RTP is a state-mandated plan that identifies transportation needs in Santa Cruz County over the next twenty-plus years. It estimates the amount of funding that will be available over this time frame and identifies a financially constrained priority list of projects. Projects identified in the 2040 RTP include maintenance of and improvements to local roadways, highways, bicycle and pedestrian facilities, transit service, rail, specialized transportation for seniors and people with disabilities, and transportation demand management programs. Projects were selected that support sustainability goals including access, greenhouse gas emission reduction, economic vitality, health, safety, travel time reliability, equity, and maintenance of the existing transportation network. Individual projects listed in the RTP must still undergo separate design and environmental processes, and can only be implemented as local, state and federal funds become available. 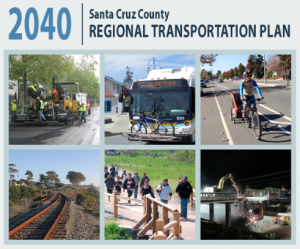 The RTC adopted the 2040 Santa Cruz County Regional Transportation Plan and the corresponding environmental documents in June 2018. The draft 2040 RTP was available for public review and comment from December 8, 2017 to February 5, 2018. The Santa Cruz County RTP is also incorporated into the Association of Monterey Bay Area Governments’ (AMBAG) tri-county Metropolitan Transportation Plan/Sustainable Communities Strategy (MTP/SCS) that covers the counties of Santa Cruz, Monterey and San Benito. The Santa Cruz County RTP must be consistent with and plan for a transportation system that supports the California Senate Bill 375-mandated Sustainable Communities Strategy (SCS) for reducing greenhouse gas emissions, which is included in the AMBAG MTP/SCS. An Environmental Impact Report (EIR) pursuant to California Environmental Quality Act (CEQA) has been prepared for the 2040 Metropolitan Transportation Plan – Sustainable Communities Strategy and the Regional Transportation Plans for Monterey, San Benito, and Santa Cruz Counties (2040 MTP/SCS and RTPs EIR). The EIR for the 2040 MTP/SCS and RTPs collectively details the potential environmental impacts of the three RTPs for Santa Cruz, Monterey, and San Benito counties and serves as the EIR for the 2040 Santa Cruz County RTP. The 2040 MTP/SCS and RTPs EIR presents a region-wide assessment of potential impacts on the physical environment and identifies strategies to avoid or mitigate significant environmental effects. Projects will undergo a separate environmental review process, conducted by their agency sponsors, once they actually receive funding and are ready to proceed. The Association of Monterey Bay Area Governments (AMBAG) certified the Final EIR prepared for the 2040 MTP/SCS at their June 13, 2018 meeting. At the June 14, 2018 meeting, the Santa Cruz County Regional Transportation Commission (RTC) considered the Certified Final Environmental Impact Report for the 2040 Santa Cruz County Regional Transportation Plan; and adopted the Findings, Statement of Overriding Considerations, and Mitigation Monitoring and Reporting Program related to the Final EIR certified by the Association of Monterey Bay Area Governments for the Santa Cruz County Regional Transportation Plan, as the lead agency under CEQA. The draft EIR was available for public review and comment from December 8, 2017 to February 5, 2018 and a public hearing was held in Live Oak on January 30, 2018.